(2) The decision to stop using Lovecraft’s image on the World Fantasy Award was, needless to say, unpopular with many commenters on H.P. Lovecraft’s Facebook page. (3) Nick Mamatas is running a poll asking “What should the New World Fantasy Award be?” – where participants get to choose among his own satirical answers. (4) Sam Kriss explains, in “The Englishman and the Octopus”, why Spectre is really a Lovecraft story, not a Bond movie. (5) Houghton Mifflin Harcourt will launch a new SF/F book line edited by John Joseph Adams reports Locus Online. The new list, called John Joseph Adams Books, will begin in February 2016 with print editions of three backlist Hugh Howey titles. Adams will serve as editor at large for the line. He began his association with HMH when he became series editor for the Best American Science Fiction & Fantasy series, launched this year. (6) Buddy’s Antique Auction in Arab, Alabama might not be the first place you’d look to buy a genuine Lunar Rover — but it should be! That salvaged LRV recently in the news will be there for sale to the highest bidder on November 21 at Noon. We are proud to announce that we have been commissioned to sell at public auction this very special piece of historical value. This Lunar Rover or “Moon Buggy” as it is comonly called is a prototype from the mid 1960s. NASA engineers were studying ways for the astronauts to be mobile while on the moon. 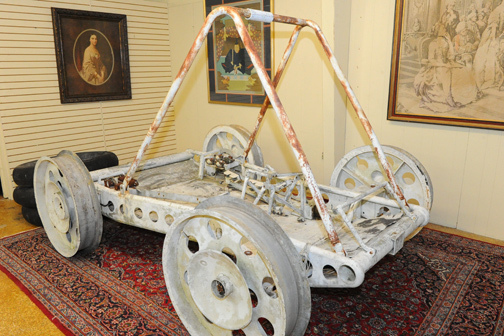 This buggy never went to the moon but has been authenticated by a retired NASA scientist and he believes Wernher Von Braun was photographed on this buggy. “Moon Buggies” were used on the moon and three are still there. This is definitely a piece of history some space enthusiast could lovingly bring back to its original glory…. This is a special auction and will be for the Moon Buggy. This will be the only item in this auction and will be held at 12:00 Noon at the Worley Brothers Antiques building. (7) Sarah Chorn writes frequently about accessibility, and her latest post at Bookworm Blues is a status report in general about conventions’ support for special needs. That’s the thing that really irks me about this issue. Accommodation is still something to be praised rather than a normal thing. It’s an event rather than an occurrence. Furthermore, there are still times when there are problems and people get excluded or edged out due to these problems. The dialogue about this is still minimal in the genre. There is still almost no discussion about these problems until something happens and there is a small outcry. (8) Roger Tener gave permission to reprint his account of Nancy Nutt’s memorial service from Chronicles of the Dawn Patrol. Saturday [November 7] was the Memorial Service for Nancy Nutt. David and Sherrie Moreno, Cathy, and I drove up to Kansas City It was an opportunity to spend time with friends to comfort each other and remember Nancy. There was a couple of tables set up in a small room with pictures that Nancy had taken over the years. Nancy’s family told us to take any of the pictures we wanted. There were several pictures of Fans and airplanes. More specifically airplanes that I had flown Fan gatherings. After the service many of us gathered at Genghis Kahn for supper. After we ate we stood outside the restaurant and talked and talked and talked in the finest Fannish tradition. We will miss you Nancy. (10) Misty Massey says there are reasons for not “Breaking the Rules” at Magical Words. And one more that’s happened recently (and been done by more than one person) “If you’re new to us, send us a writing sample of the first five pages of your published work.” And instead, you send us a link to your website. Sure, that website may have oodles of your work on it, but you just showed us that you can’t follow simple instructions. Why would I believe I should work with you? The point of all this is to make sure you guys who DO follow the rules and who DO read the guidelines carefully know that we on the other end of those guidelines appreciate the effort you take. We may not open our next letter to you with the words “I see that you followed our guidelines” but you can just bet that you’re even hearing from us because you did. And one other thing to remember…publishing is a tightly-knit business. If you behave in a jerkish manner, breaking rules and skipping guidelines for one editor, don’t be surprised when another editor seems uninterested in working with you. Word gets around. (11) Rachael Acks’ contribution to SF Signal’s MIND MELD: Must hear audio fiction, accidentally left out of the main article, appeared today. I listen to a lot of audio books, because I’ll have them playing while I’m describing core, processing data, or driving. (And I tend to listen to them over and over again, since I will miss things sometimes.) The two authors whose audiobooks I own the most of are Lois McMaster Bujold and NK Jemisin. I’m not sure if that’s because their work lends itself particularly well to the format, or just because I love everything they write anyway. I actually didn’t own a written copy of any of Bujold’s books until this year, and reading it normally felt weird—so many things weren’t spelled the way I thought they would be. This also made reading The Hundred Thousand Kingdoms after I’d listened to it first a slightly odd experience. (12) Jim C. Hines says it’s time for a “NaNoWriMo Pep Talk” about hitting the wall. This is the time in Jim’s writing process where, like Charlie Brown kicking at that elusive football, I lose my footing and end up flat on my back, staring into the sky and wondering what the heck just happened. My shiny new idea isn’t quite so shiny anymore. I’ve gotten lots of words down, but they don’t exactly match what I was imagining. And this next part of the outline doesn’t make any sense at all, now that I think about it more closely. Good grief, the Jim who was outlining this thing last month is an idiot. And now I have to fix his mess…. November 9, 1984 – Silent Night, Deadly Night premieres. To protest the film, critics Roger Ebert and Gene Siskel read the credits out loud on their television show saying, “Shame, shame, shame” after each name. (15) Contrary to what some people may believe, John Scalzi’s cat Zeus does not require any more attention from the internet than he’s already getting. One, he’s perfectly fine, merely not at the center of my public discussion of cats in the last week as he neither a) a kitten, b) a newly-passed on senior cat. You should be aware that Zeus has been perfectly fine not being the center of media attention in the last several days, as he is a cat and has not the slightest idea either that I write about my cats here, or that any of you have any idea who he is. But he is alive and well and doing what he does. (16) “A Death Star Filled With Plastic Stormtroopers Is a Better Bucket of Army Men” opines Andrew Lizsewski at Toyland. If there’s one toy that defines cheap and mass-produced, it’s those buckets full of tiny green plastic army men. They really stop being desirable once you turn six, except when those plastic soldiers are replaced with tiny white stormtroopers led by an equally tiny Darth Vader. (17) Alastair Reynolds tells what it was like to be a huge fan of the original Star Wars at Approaching Pavonis Mons by balloon. Which was only the third record I’d ever bought, after the Jaws theme and Queen’s We Are The Champions. (18) If Reynolds doesn’t know these 12 facts about Yoda already, he soon will. When Stuart Freeborn, the make-up artist who was tasked with creating Yoda, looked into a mirror, he saw Yoda. No, it wasn’t a Disney magic mirror, but rather it was Freeborn’s own reflection that inspired Yoda’s final look. When Freeborn modeled himself and started sculpting Yoda, he emphasized his bald scalp, wrinkles, and pointed chin in order to bring Yoda into the world. According to Freeborn, the only part of Yoda that wasn’t based on himself was the upper lip, in which he removed the famous mustache of Albert Einstein and ported it onto Yoda’s face. This move was meant by Freeborn to trigger a subconscious association in the audience with Einstein’s intelligence and wisdom, thus making Yoda appear intelligent before he even spoke a word of advice in his lovable, fractured English. (19) Even before the internet you couldn’t believe everything you read as Matt Staggs proves in “Four Times Science Almost Flew Off The Rails: Bat Men On The Moon, Phantom Planets, Ghosts, and The Hollow Earth” at Suvudu. 2) When We Thought Bat People Lived On The Moon Ah, 19th century New York City: a place where the lanterns burned all night, Bill the Butcher and his gang of Know-Nothings spattered the streets with blood, and four-foot tall bat people looked down upon it all from their home on the moon. What, you don’t know about the flying lunar bat people? That’s because they were the invention of a master troll named Matthew Goodman, editor of the Sun newspaper. Singer and actress Mariah Carey has joined the cast of The LEGO Batman Movie. According to The Hollywood Reporter, she’ll voice the mayor of Gotham City. This report is contrary to a Deadline report that she would be playing Commissioner Gordon — which only works if she’s playing Commissioner Barbara Gordon from the animated Batman Beyond. Of course, that’s completely possible, too, given how the first LEGO Movie mashed up characters from all over the story multiverse…. (21) This just in – eight years ago. Italian Spiderman has its own Wikipedia article! Italian Spiderman is an Australian film parody of Italian action–adventure films of the 60s and 70s, first released on YouTube in 2007. The parody purports to be a “lost Italian film” by Alrugo Entertainment, an Australian film-making collective formed by Dario Russo, Tait Wilson, David Ashby, Will Spartalis and Boris Repasky. Ostensibly an Italian take on the comic book superhero Spider-Man, the film is a reference to foreign movies that misappropriate popular American superheroes such as the Turkish film “3 Dev Adam”, and licensed series such as the Japanese TV series “Spider-Man”, both of which alter the character of Spider-Man for foreign audiences. Other notable entries include the Indian version of Superman (1987), I fantastici tre supermen (3 Fantastic Supermen) (1967) and La Mujer Murcielago (The Batwoman) (1968). (22) A Robot Chicken video, “The Nerd on The CW,” parodies Arrow and The Flash. This entry was posted in Pixel Scroll and tagged Alastair Reynolds, Alex Acks, Carl Sagan, Chronicles of the Dawn Patrol, George R. R. Martin, Jim C. Hines, John Joseph Adams, John Scalzi, Kameron Hurley, Lego, Lovecraft, Mark Lawrence, Misty Massey, Nancy Nutt, NASA, Nick Mamatas, Roger Ebert, Roger Tener, Sarah Chorn, Star Wars, Tom Galloway by Mike Glyer. Bookmark the permalink. Yes, I liked the women too, but it was a shame that in a film that did really well at casting a diverse range of male actors, the women of future NASA were almost all white – even Mindy Park, who I’m reasonably certain was intended to be of Korean descent. None of the actresses did a bad job, but… I’m pretty sure there’s an actress out there with Korean heritage who could have been an awesome Mindy Park, too, you know? It just would have been nice. 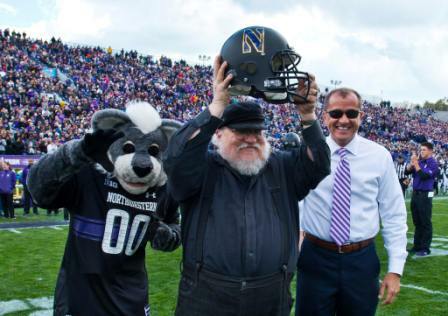 @Kendall — That’s right: I think she wrote the original Nightrunner trilogy, then the Tamir Triad, then another, what, two more Nightrunner books? (Which I don’t think I’ve read yet; or at least not both of them.) And yeah, I do remember some dark bits in what I read, but just not on the same scale as in the Tamir books. Yes, I agree it was a bit of a surprise to see Mindy Park played by an actor who couldn’t possibly be Korean. I hope this doesn’t seem nitpicky (oh wait, fans, never mind), but one minor correction for your review: the potatoes were intended for eating, not for planting. I think it speaks to Watney’s resourcefulness and ability to repurpose the things he had available. In the book, which I’ve just started, he mentions that the mission organizers thought it would be good for morale for the crew to actually cook dinner on Thanksgiving, not just reheat it, which is why they sent potatoes refrigerated rather than frozen or as potato flakes or something. One thing I’ve noticed about the book is that although the first-person Watney sections are funny and well-rounded, the third-person ones back on Earth feel very flat. I’m glad I saw the movie first, so that (for instance) during the scene where Kapoor and Sanders are discussing satellite time, I can now imagine those actors in place of the almost-flat written version. @Lexica When I hit the first third-person section I was sure that in two pages it would turn out that Mark was writing wish-fulfillment fanfic. Loved it. Eagerly awaiting the next installment. Me too, though you’ve got me a little unsettled about being here alone with my laptop and italics. @Lexica– That’s not nitpicking; it’s a factual detail that matters because facts! I will try to stay awake long enough to fix it. Thanks. @Joe H.: I think you’re right about when she wrote them. There are four more books after the first three, and I’d really call the original three a duology and then a slightly removed sequel. The next four, similary, are sort of a duology (an overarching plot) like the first two, then two that basically stand “alone” (not that one could read this series out of order, but you know what I mean, hopefully). @Lexica: A few of on-Earth scenes in The Martian made me laugh, actually (not that I remember off-hand which or why, sorry), but I should admit I tend to read late at night, so maybe I get a bit punchy? The first one just took me totally off-guard; I thought basically 90% of the book would be Watney, and then suddenly it flipped to Earth. Mandatory post in honor of another of Hal Winslow’s old buddies, one of the most famous of them all (#1)! I’d heard about this through this lovely episode of The Memory Palace, my favorite tiny podcast. Eps are only a few minutes long, and he does this blend of history and poetic fiction (sometimes a little heavy on the poignant, but I’m sappy like that) that I love. Many are space-related (like Glowing Orbs). […]Or maybe they should have a goblin whichever is easier. If this really was Usenet, I’d give you a rasseff award. With goblins, that you can only see out of the corner of your eye. @ Dr Science & Mark, re Magonia: I second Mr Dr’s “*astoundingly* well-written”, but I wasn’t at all put off by the second part’s lack of logic. I see how the magical world could have done with some unpacking (and if that would have meant spending more time with squalwhales, yes, please), and the obligatory speed towards a climax may be getting in the way of a more balanced narrative, but then, I’m biased against that shape of plots. I have some quibbles that are spoilerish, but I’m pretty sure I’ll be putting this on my ballot, even so. She had me at E.E. Cummings. @Mark, for calibration, I loved “If You Were a Tiger …” and “Some Gods of El Paso”. OTOH, Magonia doesn’t really resemble any shorts I’ve read. Or anything else, really, hence the probable nomination. And don’t be put off by comparisons to John Green, there is no relation between this and The Fault in Our Stars that’s not superficial. Making note of the fact that I have both a new Gene Wolfe and a new Ursula LeGuin to get hold of. A new Le Guin? What? Where? Not actually a new LeGuin, but one I missed. Lavinia. Ah. That’s too bad. For the more Le Guin hopeful, I mean. Lavinia is just beautiful. Your version of the statue sounds awesome. Oh yes, the ‘doing the other thing I’m supposed to do to make myself do the thing’ dodge. The only time I have ever had a clean house is when I was writing my dissertation. These days I don’t even do the other thing I’m supposed to do, and skip straight to reading. Guilty. I’ve also typeset a couple (fiction) books in LaTeX. Well, when I wrote my thesis (back in 1992), I got handed a LaTeX document stylesheet as the method by which all theses for the department were to be formatted. So I learned LaTeX out of sheer necessity, found it useful as a good combination of authorial control and structural handling (which Word can do, but how many people actually use outline mode), and then just kept using it personally because I knew how to make use of it. Then again, well, the first computer interface I used was an IBM thermal paper terminal with an acoustic modem, so my expectations for text editors started off really modest. The full-screen of vi was already a step up. And that’s another case where I learned how to really make good use of it back in University: if I can make the simple tools dance, why bother with the memory hogs?